The Opinionated Pussycat: World Mews Repurrt: We Report, You Toss In Your 2 Cents! In January 2013, the hosting of the Cat Blogosphere website & pages was transferred to Morgen Pittman, who is the current Managing Editor of the site. His cat Little Isis is the Lead Reporter. That will soon change or the site will be no more and a legend in the pet blogging community will be no more. Our dear Nikita would be deeply saddened by this state of affairs. On October 1, 2013, the cat blogging community lost a legend, and this blog lost a friend. Hello, felinity assembled, Nikita here and I have some very sad news to report: Cokie the Hollywood Insider has travelled to Rainbow Bridge. In the wake of the passing of Cokie have you posted a tribute on your blog? Do you have a special memory you would like to share with your readers in a post this weekend? I will be hosting the very special 500th edition of Carnival of the Cats, the oldest continuously running blog post sharing event for pet bloggers on the internet, and one of the oldest share fests online, period. Do you also have Carnival hosting memories to share? Do a blog post about it! It began in 2004 and used to get 40 to 70 submissions a week! We here, at The Opinionated Pussycat intend to celebrate that legacy, but we would also like to make it a place where felinity assembled can share how it celebrated the life of Cokie the Hollywood Insider. Cokie appears to have begun his blogging career 8 days after I moved from daddy's blog to this one, in January 2010, and an even greater presence in the blogosphere came in the spring with The Anipal Times..
Daddy had the honor and pleasure to meet Cokie's human, Kristin Dewey, at a charity event in Los Angeles, in August 2011. Dear kind, funny, talented, encouraging, inspiring, caring, beautiful man cat, I know that you will have found release from the pain of the last few years at last and are being welcomed by friends who went before. As I mourn your passing this old geezer knows that I might not make it to 20 either and look forward to someday making your acquaintance in person, at last, just as your Mom & Daddy Kiril once met in LA. It has been an honor and a pleasure to know you, read your blog, and receive comments from you on Opinionated Pussycat. The best way Elvira and I can honor your memory is to carry on our own writing lives in new and better ways and we fully intend to do so. Rest in Peace, and may the catnip and kibble and toys be plentiful and just to your liking at Rainbow Bridge. Brought to you by the world class repurrting and researching team of Nikita and Elvira Mistress of Felinity, at the Feline News Network (FNN)! We encourage you to leave your thoughts in the comments, link back to our reports on your own blog, so others can be made aware of the latest news and if you come across a story you think we might be interested in, alert us via the e-mail in the sidebar. We consider it our mission to bring you the news that possibly no-one but our fellow felines and their humans, could give a fig about!We aim to point you toward these stories and sometimes even toss in our 2 cents worth on them as well. 3 and 4. I woke up from a nap the other day to find Daddy Kil laughing so hard he was in tears. So I went to see what brought this on. Let's just say that this is what happens when some very talented humans have nothing better to do and think they actually understand their animal companions. Lorrie Shaw explains how "understanding different play styles in cats can help manage weight & enhance mental fitness". "for felines, it can seem more challenging to hone in on what kind of activities and interaction not only captures their attention, but what keeps them engaged. This is especially true of indoor-only cats." She actually does a good job discussing such activities as birding, pouncing and stalking, bunny games, as well as hide and seek. 6. Humans of a certain age remember growing up learning from ‘Mister Rogers’ Neighborhood’, and even introducing their children to the show. Well, now, a feline has moved into the neighborhood to carry on he legacy. 7. "Catroulette" is a cat adoption website that allows humans to skip through videos of cats and kittens looking for forever homes until thery find one that they would like to adopt. It seems that several cat adoption agencies in Belgium are behind this program. One depressing aspect of all this is that the viewer can actually see how many humans have skipped over a particular hopeful feline. Next up = Elvira Reveals Secret 1 yr. Anniversary Photos! Does your love of kibble mean you are insane??? Believe it or not, there are some human researchers who say "it is a sign of a creature whose obsession with food has driven it to the edge of insanity. behaviour. And the attention-seeking behaviour is a symptom called “excessive solicitation of interspecific interactions”." Say WHAT??? The comments are just as interesting as the posts. Nikita here to welcome in the new year! Brought to you by the world class repurrting and researching team, of yours truly, Nikita Cat and Elvira Mistress of Felinity, at the Feline News Network (FNN)! We consider it our mission to bring you the news that possibly no-one but our fellow felines and their humans, could give a fig about! We aim to point you toward these stories and sometimes even toss in our 2 cents worth on them as well. 1. One more bit of holiday cheer as we head into the new year. This story comes from here in Houston, and was reported in the Houston Chronicle by reporter Kyrie O'Conner. Five kittens were recently left by the side of the road within hours of their birth, and without their mother. A caring lady, on her way home from a coffee shop, one morning in November, stumbled upon the kittens, and took them home to try to rescue them. Not being the least bit familiar with how a mother cat cares for her newborn she called on friends, veterinary hospitals, whoever might help her out. She posted on Facebook. She packed her husband off on a mission to get kitten formula. This story would be one with a tragic ending except that one of the kittens is a fighter, and under the care of a friend of the lady who found them. The last kitten is named Shanti Tigerheart. "Shanti" means "peace" in Sanskrit, and Tigerheart describes her fighting spirit. She's a climber, and she's learning to pounce. Sometimes she rides in a ski cap tied around Runfalo's neck. Read the whole story, and see the little tiger, here. 2. Another Houston Chronicle story, by Jayme Fraser, to end 2012, is about the local Assistant District Attorney who "Gives voice to the voiceless", in the city, and county, animal community. I can't share the link to the story as you must be a subscriber to their website, but I read the print version of the Dec. 30th piece, and think i's worth sharing. Belinda Smith is my kind of human. in 2006 she bacame the first local prosecutor to focus on animal cruelty. The article quotes her as saying this: "I know a lot of people don't think animals have souls, but I feel like when I'm in heaven, I'm going to get to see all my animals." She is considered the leader in the city's coordinated community campaign to put an end to animal cruelty, because the city and county didn't used to do a very good job. She has been instrumental in getting area law enforcement and animal welfare groups to work more with each other. An old issue of the Harris County DA Employee Newsletter in Jan. 2009, was quite in formative. HBA Salutes Belinda, in 2009 for her work. The Animal Law Section of the Houston Bar Association last month honored Belinda Smith, the District Attorney‟s Animal Cruelty Section chief. Page 2 has an article about the, then, new Animal Cruelty Section. The University of HoustonLaw Center, in the Spring of 2009, did a story on Belinda as well. I couldn't find a link just for the section, itself, though. Nikita here to announce that we are back, and ready to rumble! The computer is fixed, at last! 1. As we settle in to Houston we are looking to learn about shelters and rescues in the area. One of the oldest, and most respected is Citizens for Animal Protection. It describes itself this way: "Citizens for Animal Protection is a non-profit organization, founded in 1972, which shelters, rescues and places homeless animals for adoption with loving families. CAP advocates respect and compassion for animal life and provides humane education to help prevent cruelty to animals." Recently, it "received a grant for $10,000.00 from the national ASPCA (American Society for the Prevention of Cruelty to Animals) in New York. The grant will be used to supplement the cost of four “Feral Cat Surgery Days” at CAP’s in-house clinic." How this all squares with a very disturbing story in a recent edition of the Houston Press Weekly is something we hope to discover by exploring the website now that we have our computer back. It seems some volunteers, and a big name activist in town, have been caught doing a few things they shouldn't. Happy Veteran's Day, Felinity Assembled, Elvira Mistress of Felinity here! The day after the election Daddy Kiril went to the San Jacinto Battleground State Historic Site, and the nearby Battleship Texas Historic Site, and while he didn't take the tour of the ship, he did, with the help of a passer-by wielding his camera, pay tribute. Did you know that Felines, male and female, have been serving their country, in the military, for well over a century, including on a late 19th century USS Texas? Born on the ship in about 1892, he became its mascot, and served in the Spanish American War! There is a wonderful photo on page 26 of this edition of Munsey's Magazine (Just carefully scroll to the page). A few years aftger the war the ship apparently had a new cat, and a dog, on board. "The SS Jupiter was an American cargo ship built in 1917. Later that year she transported World War 1 cargo, and while doing so she carried a Naval Armed Guard unit. The photo shows a J.E. 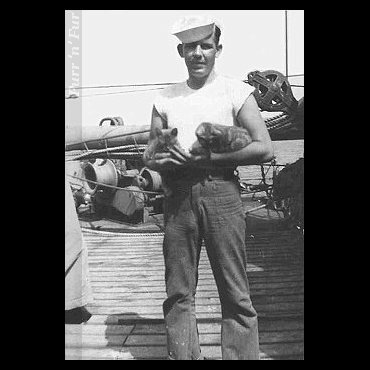 Hall with the ship's cats, Snow and Mouse"
"The third ship to bear the name, Merrimack was a fleet oiler acquired by the United States Navy in 1941. Commissioned in 1942, she served in both the Atlantic and Pacific during World War II and gained eight battle stars. 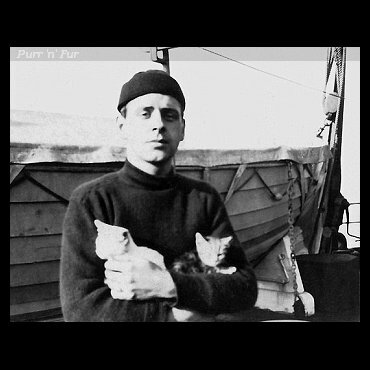 She had two ship's cats, appropriately named Mary and Mack." Good evening Felinity Assembled, Nikita here. 1 - 3. Let's begin by saluting the Ultimate Sacrifice by British Military Animals, and the latest honoree to receive the PDSA Dickin Medal: 'The Animals' Victoria's Cross'. If you explore the PDSA site you will learn about the only Feline to so far have been honored. Animals in the Military and Pets for Vets: Learn About, Support, the Troops! 4. 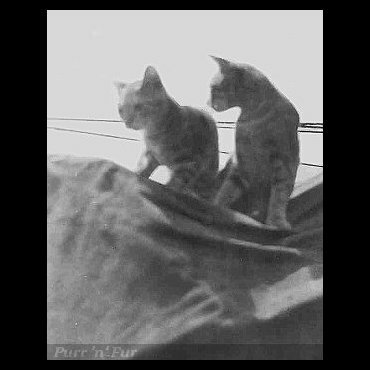 Cats have been taking our medicine for centuries, but did you know that, in 1903, George Albert Smith made a silent short titled “The Sick Kitten,” famous, at the time, for its awesome close-up shot of a kitten eagerly taking medicine from two small kids. 7. Here in Texas, dumping Kittens IS considered illegal dumping. 8 and 9. From Global Animal in 2011: Cooney’s Law Fights To Stop Animal Abusers, Violent Criminals, in Nevada. A first offense of animal cruelty is a felony in the state, and while some find the law controversial, it passed, and will now get its first trial in court.